Amid Ethnic Cleansing in Myanmar, Where Does Transitional Justice Stand? During the past month, over 400,000 members of Myanmar’s Rohingya Muslim community have been driven from their homes as part of an ethnic cleansing campaign led by the military. The massive violations are the latest chapter in decades of discrimination against the ethnic minority, which has continued even after Nobel Peace Prize Winner Aung San Suu Kyi assumed de facto control of the government in 2016. Suu Kyi’s government currently rules alongside the military, which retains a tight grip on key decisions. The systemic violence is occurring at the same time as Myanmar’s ongoing political transition, which includes peace talks between the state and armed groups representing some of the country’s ethnic minorities – but not the Rohingya. 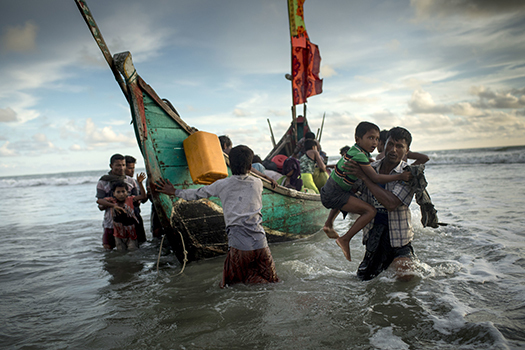 ICTJ’s Sam McCann sat down with Anna Myriam Roccatello, who oversees ICTJ’s work in Myanmar, to discuss the roots of the campaign against the Rohingya and its implications for transitional justice in the country. The current violence against the Rohingya people has deep roots. How does this history fold into today’s human rights crisis? Anna Myriam Roccatello: What we now finally call ethnic cleansing in Myanmar has gone on for years. There have been moments of particular intensity, but it is not new. There was arson before, there was forced displacement before, there were alleged sexual crimes before. But the scale of the violations as well as the international attention paid to it has increased. Anna Myriam: On August 25th of this year, Rohingya militants attacked police stations. The government responded by launching a “clearance operation,” which amounts to an ethnic cleansing campaign that resulted in a surge of violence against civilians and massive displacement. But at a fundamental level, the Rohingya community has been the target of systematic violence and discrimination for decades. How is the political transition connected to the crisis? Anna Myriam: The main impact is on the peace process, and we know that there has been some progress in that regard. However, the peace process never been inclusive, and it has not improved since Suu Kyi’s National League for Democracy (NLD) came to power. There was a decision to allow only certain armed groups thatthe state recognizes as “legitimate” interlocutors to sign the cease fire agreement in 2015. This decision was made by the government without a transparent process. The Rohingya were never considered “good enough” to be at the table and until recently the Rohingya did not have an armed group of their own. More importantly, they have been denied citizenship. The state does not recognize their right to be in Myanmar, and they are the target of a campaign in which they are presented as unworthy of respect or recognition as human beings. Lack of inclusiveness aside, the peace negotiations have introduced some interesting ideas, for instance having an institutionalized dialogue between the armed groups at the table and civil society. In theory, that would ensure that negotiators are representing civil society’s views. In practice, however, armed groups are not necessarily the best representatives of civil society. Given the current structure of the dialogue process, civil society does not feel that they have a space to put forward their voices, influence, and inform the peace process. At the end of the day I have not seen any proposal that is really around the vindication of victims’ rights. The political dialogue does not appear to discuss remedies for the past or to confront the atrocities committed by the military regime that has held power for over 50 years. Even if the current NLD-led government had any intention to recognize victims and their rights, it would not have the ability to do so because of military influence. The Rohingya are the most immediate victims of that failure, because their right to exist in Myanmar has never been recognized. At the same time, I would like to stress that there are many victims in Myanmar beyond the Rohingya whose path to justice is blocked. Can you tell me more about the tension between Muslims and Buddhists in Myanmar? Anna Myriam: There is a virulent strand of Buddhist nationalism and supremacy running through the country, and the plight of the Rohingya, who are Muslim, is largely ignored or even exacerbated because of ethnic divides. If you look at previous incidents, they often start with accusations from nationalistic monks, who would accuse Muslim men of sexual assaults against Buddhist young women. Violence against Muslim communities would then follow, including arson and assault. Again, this persecution has a long history. The Rohingya are a pariah in a culture in which respect for human rights is very low and there is no reckoning with the past. There was this groundswell of hope in 2016 when Aung San Suu Kyi took office. How has that hope diminished so quickly? Anna Myriam: There are a number of reasons. The first is that expectations surged among the international community when a Nobel Peace Prize winner became the de facto leader of a government. ICTJ, among others, was very quick in demanding for visible, concrete changes in policy after Suu Kyi’s NLD party took over. Analysis of Suu Kyi as a leader did not accurately assess her ability to represent civil society that is not directly aligned with the NLD agenda. And that is even more true for civil society representatives of ethnic minority groups, who have aspirations of decentralization, if not federalism. I think we all lacked a deep understanding of her way of operating as a leader. She is worshipped in much of Myanmar. Her charisma and her symbolism is important. But she was not tested. She came into power in a difficult context in which the military still has a tight grip on crucial decisions, after a transition – if transition can be spoken of – just a few years removed from a total military junta. Given this complex dynamic, ending the carnage in the Rakhine State will require a shift in power that will depend on more than Suu Kyi’s stances. Her handling of human rights in Myanmar, particularly the Rohingya ethnic cleansing, has been abysmal. But the tensions arising from mixed military and civilian rule must also be resolved. The democratically-elected civilian government must be extricated from military control, and it must hold the regime accountable for its crimes. Suu Kyi has said that "both sides are to blame"for the violence, called the atrocities "fake news", and invoked the specter of terrorism in talking about the Rohingya. Does transitional justice have a role in countering these narratives? Anna Myriam: Transitional justice can be an excellent tool to counter these narratives and raise victims’ voices. It is crucial to remember: even if the Rohingya armed group could be defined according to the applicable law as terrorists, even if they have committed violations of human rights for which they remain prosecutable, the large-scale of violations and the massive displacement was caused by the government forces. There were reports a couple years ago that alleged the Rohingya would become a very likely recruiting pool for extremist groups like ISIS. If you take a group of absolutely desperate individuals who are constantly battered, oppressed, repressed, violated in the most atrocious ways, whose very right to exist is denied, that in itself is a perfect recruiting ground for extremism. Because the state pushes them into a situation where people are more likely to turn to violence. Why has the international community been ineffective in ending the ethnic cleansing? Anna Myriam: Having witnessed the very sensitive transition step-by-step, from total military junta to partial civilian control, the general position among the international community was to hold their breath and not compromise the delicate and slow opening up of the country. It is important that the Rohingya situation is now being covered heavily, which keeps the attention on a problem that has roots decades deep. And let us not forget that the United Nations established a commission of inquiry to investigate the crimes in the Rakhine state that was not given permission to enter the country. But what can the international community do now? It is hard to determine what measures would be most effective now, in the midst of the crisis. But had efforts to acknowledge victims been more actively supported by the international community in the last several years, the political dynamic might be different. Moving forward, once the violence stops, accountability and reforms must be pursued with renewed vigor to ensure a sustainable peace. Doing so will hopefully provide the opportunity to address the massive violations against not only the Rohingya, but against all victims of the regime.